While many of us may be veterans when it comes to cooking Thanksgiving turkey, every year is someone’s first year preparing the bird for their friends or family. If this will be your first attempt and you’re not sure what to do, don’t panic. You’re not the only one who doesn’t know how to cook a turkey! That’s why we’re sharing our simple turkey recipe for beginners that’s guaranteed to look amazing, taste delicious, and even impress your relatives! If you’re worried that you don’t know how to cook a turkey for Thanksgiving, it’s actually much easier than you might imagine. 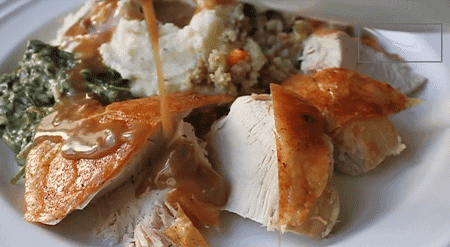 Just follow these simple turkey recipe instructions and you can’t go wrong! Start with a large roasting pan or baking dish. 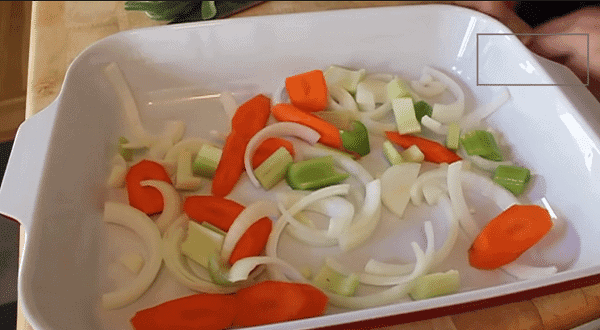 Slice up one carrot, one onion, and one rib of celery, then place the mixed veggies in the bottom of the pan. If you don’t know how to cook a turkey, this is the messy part. 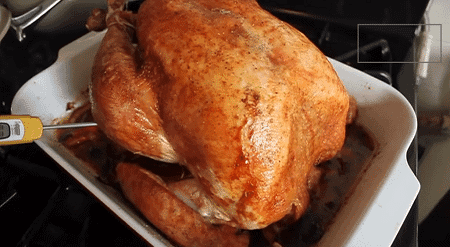 Unwrap your turkey, rinse it off, dry it thoroughly with paper towels (inside and out). Cut the tail off if it’s still there, then remove the bag of gizzards and the neck from inside the bird. Don’t throw them away though, as these parts can be used for gravy and other dishes! Keeping with our theme of just-the-basics, mix together some salt, black pepper, and cayenne pepper in a small bowl. Generously apply the seasoning mixture to the inner cavity of your turkey. Melt 3 tablespoons of butter in a small saute pan over medium heat. 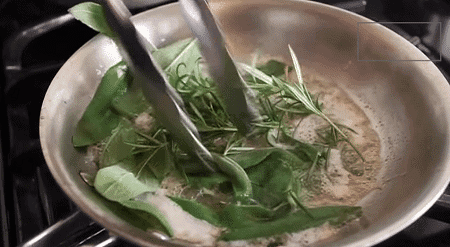 Once the butter is melted and the edges begin to turn a darker color, throw in a handful of sage and rosemary leaves and saute for 60 seconds. Turn off the heat and use tongs to scoop out the herbs from the butter, but don’t throw them away as they’re needed for the stuffing. Start by placing the herbs from the herb butter inside the turkey cavity. Use butcher’s string or even dental floss to tie the legs together so they criss-cross at the ends. 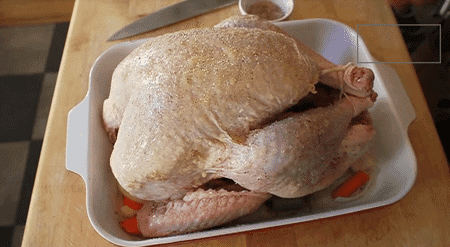 Now take a brush and paint the entire outside of the turkey with the herb butter. Cover it with a coat of your seasoning mixture. Set your oven to 325°F and roast the turkey uncovered for about 15 minutes per pound, or until the internal temperature reaches 175°F. Use the deepest part of the thigh to check the temperature, and remember not to cover the pan with anything while it cooks. Time to carve the turkey and enjoy your work! Remove the string and place the turkey on a carving board. Remove the legs and thighs, then the drumsticks, wishbone, breasts, and wings. Slice the thigh and breast meat to your preferred portions. 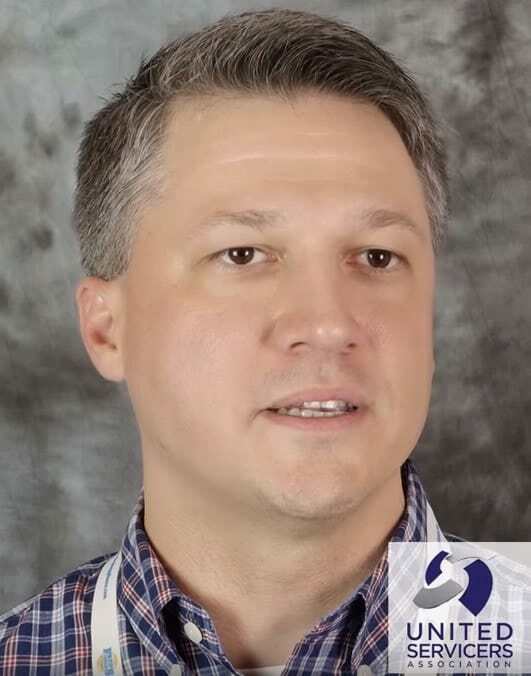 For more information on how to cook a turkey for beginners, be sure to watch the full video from FoodWishes. Looking for more tips on using your oven’s self-clean feature or where to get delicious Thanksgiving catering? 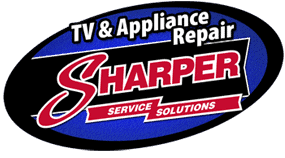 Check out our blog today, and call Sharper Service Solutions for all your appliance repair needs this holiday season!